The correction for the wave yesterday went deeper than allowed under wave rules for a 5 count and the close was under the Trend Average, so now the bias is back to the bearish side. Bears just need a solid catalyst to sell into and break the 2039.69 level to reverse the uptrend. Perhaps the Iran issue will be used as an excuse? But just like it can be used as a reason to sell, it could also provide an excuse to rally and break upper resistance. 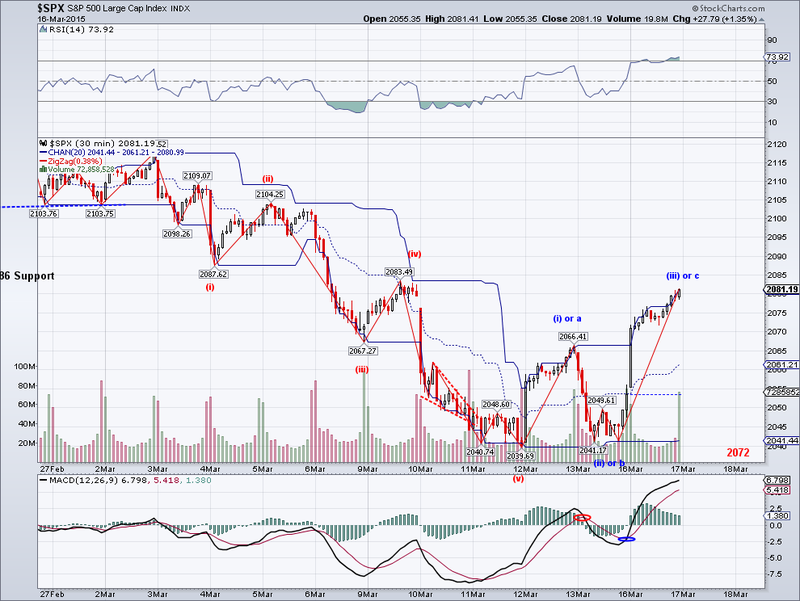 The best for now is to follow the TA until the next trend solidifies. 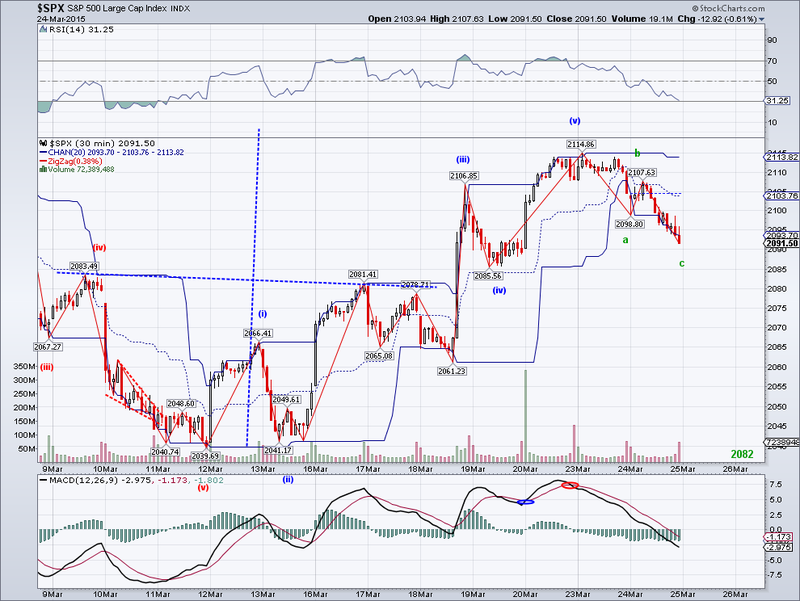 Since the close was under the TA, I bought some VXX at EOD to hold until the short term trend reverses. 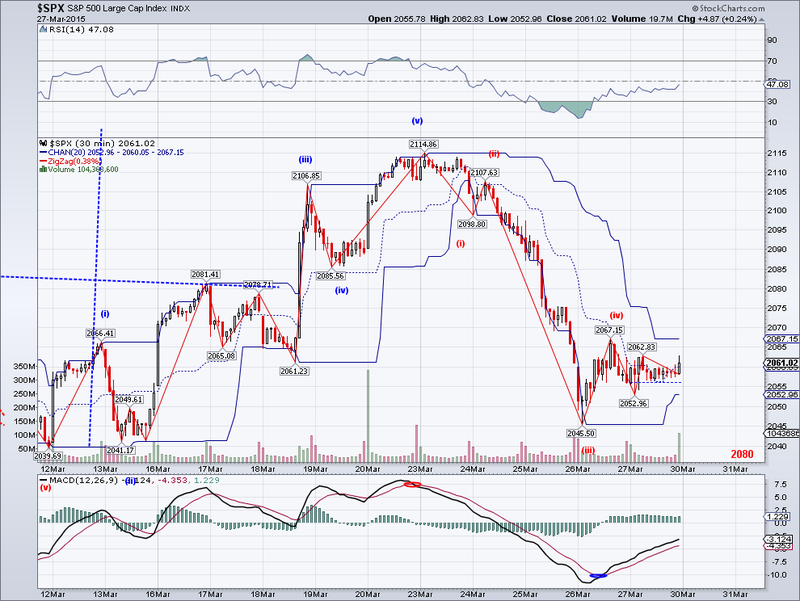 And btw, if you want to see an episode of manic-depressive trading, check out VXX's chart for today. It spiked 10%, went down 15%, up 15% then down 10% in less than an hour! I wonder how many people got screwed on these swings. It looks like manipulated move to take out trade stops as the VIX itself wasn't going up down like that during that hour. 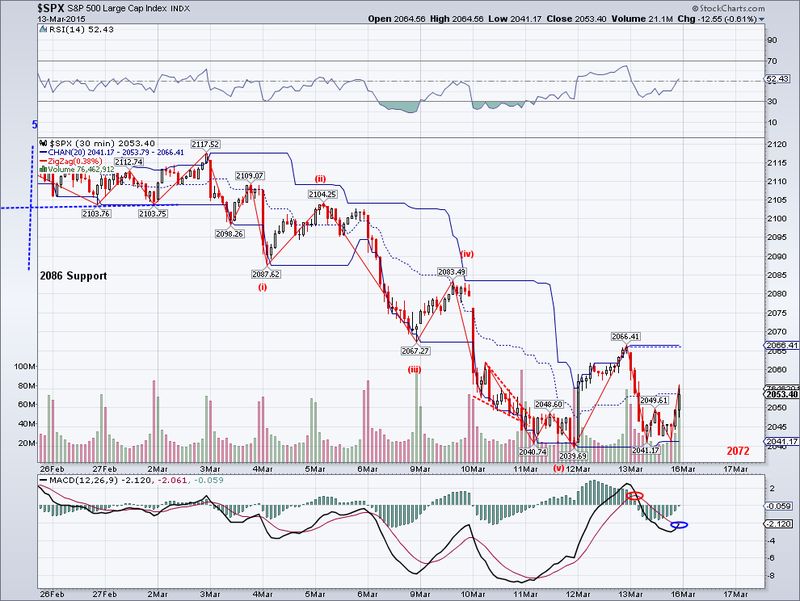 The lower low I was expecting did not come but we are now seeing the expected counter-rally. The higher low from last week leaves the uptrend intact and today's close above the Trend Average and the 50 DMA is bullish, so we might be looking at another change of trend if there is follow through buying. Couple of weeks ago I posted the following when the market topped and bears need to urgently make their case or else we might see a W3 bull run. "The ideal target level for the coming correction is 2085 before the resumption of the rally, but obviously lower levels are possible as long as 2039 doesn't get re-visited"
I originally wanted to go long at a lower low but above 2039 or short at the 50 DMA or the TA, but since the market went into what looks like a W3, there was no point. So instead I am waiting for the 5 count to complete to go short again. Alternatively, this wave today could be a C wave which keeps bears hopes alive but I lean which ever the Trend Average is pointing at. This is a bull market that just doesn't want to stop and anything other short term top calling is really a gamble. Now, despite being out of the US market completely, I had my best day this year on my long term portfolio. As most of you know, I'm up to my neck in Chinese shares and the vertical rise in the last year has been thrilling yet very scary. I can see the chart pattern but it is hard to count, so I will be relying of what I've learned in the past few years doing the SP500 and apply it to the SSEC. By the time Chinese market cap reaches 100% of GDP, I will be beyond retired and hopefully that day will come later this year or next year. However, this stuff is starting to keep me up at night. 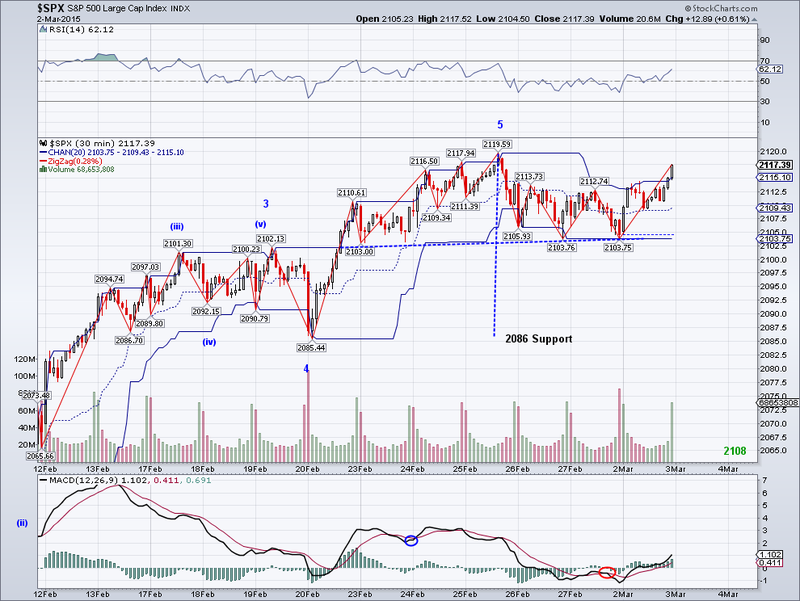 Here is my attempt to pre-count waves when the SSEC first broke out of its multi-year triangle in the summer. At that time there were none, so this was my projection which has now been clearly exceeded. The market has continued to trade in what seems like a W4. 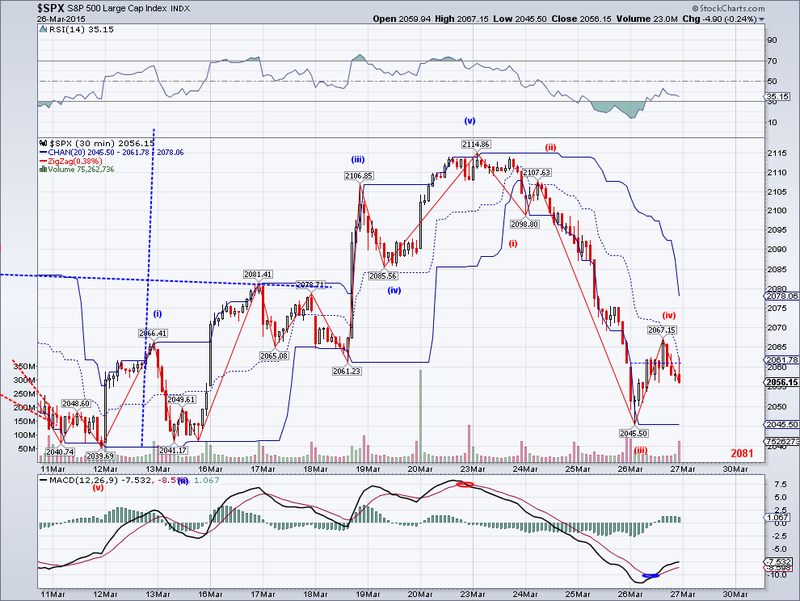 If the count is correct we will see a lower low early next week in cash or pre-market. One could make an argument for the bearish 5 count being completed at 2045, but I think it'd be better to expect a lower low for trading purposes. The big question is whether the uptrend will hold or will we see a deeper correction. The small bounce today allowed me to sell my longs for a decent profit, so I will be positioning long for another bounce or shorting again next week depending of which levels are tested first. Also, oil might provide a good opportunity next week on a sell off or a rally given the upcoming Iran nuke deal. If Iran's sanctions are lifted, there will be more oil coming into an already oversupplied market so lower lows for oil could be expected. The market started the expected bounce but it wasn't until a lower low was reached, so now the Trend Average has turned bearish and I've changed the labels on the count to reflect a bearish 5 wave count which calls for 2040 to be tested. The Trend Average signal could be whipsawed if we see a strong bullish wave tomorrow but that is not as probable, the bias is now bearish and a break of 2039.69 will likely lead to a bigger correction after a bearish B or W2 wave. If bulls are able to successfully defend the 2040 level, then I expect the market to challenge the Trend Average. I'm still holding the long position from yesterday, which I will sell on the bounce. Anyway, I ended up going long towards the end of the day as I think a bounce is due. My stop is 2039. 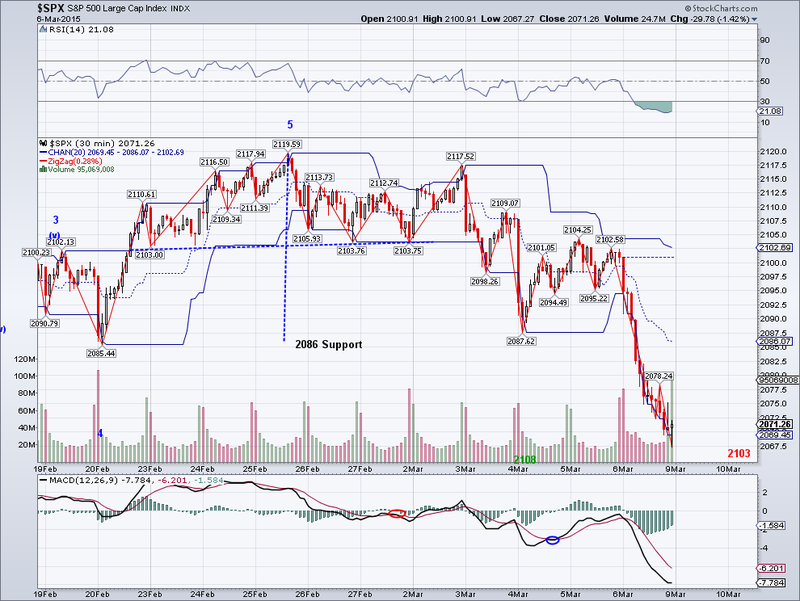 The market has continued to correct and closed within a few points of the 2085 support level. While the expectation is for the market to test support or the TA, we could see the test in after hours so we could see the market start rallying from here. As it is, there's a clear ABC move from the top and we could see the start of the next bullish wave at any moment, with the condition of course that support and the Trend Average holds. I ended up closing my shorts at a profit towards the end of the day but not going long in new positions just yet. The market started its correction as expected and I continue to expect the Trend Average or the 2085 area to be tested. It's worth noting that a bottom around the 2085 level would form the neckline for an Head and Shoulders pattern, so we could see lower lows if the coming rally forms a right shoulder. I hope I can start taking profits on my short position in the next day or two and go back long again on my trading account. The market made a higher high as expected on a 5th wave and came very close to its all time high (Russell and Nasdaq are at new highs already). However, I'm not so sure a new all time high will be put in on this particular wave as the W4 correction was fairly quick. 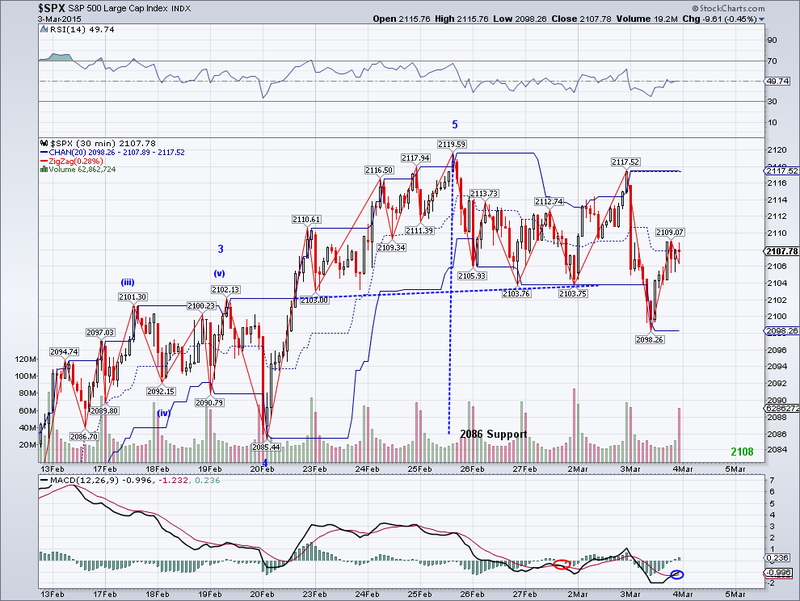 Had the market gone into a zig zag or a triangle, there would have been a better chance for a stronger 5th wave. Still, we could see new all time highs early next week before another pullback. The ideal target level for the coming correction is 2085 before the resumption of the rally, but obviously lower levels are possible as long as 2039 doesn't get re-visited. Also, there's is a new bullish MACD cross on the daily so don't be surprised to see 2,200 in April or May. I ended cashing out on my Russian position and Oil, which both rallied hard today. I will probably buy them both back on a pullback to their Trend Avg. 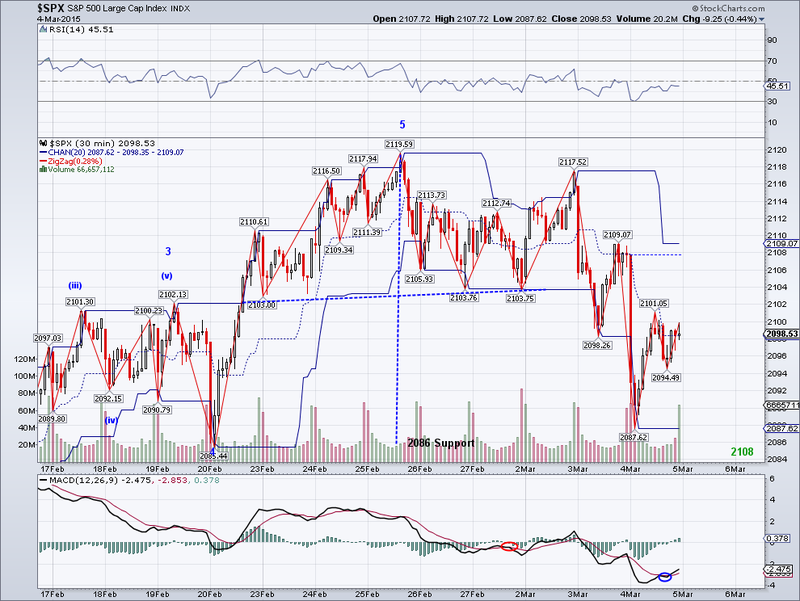 Also, I went short the SP500 for the correction to hopefully pick up a few extra $$. 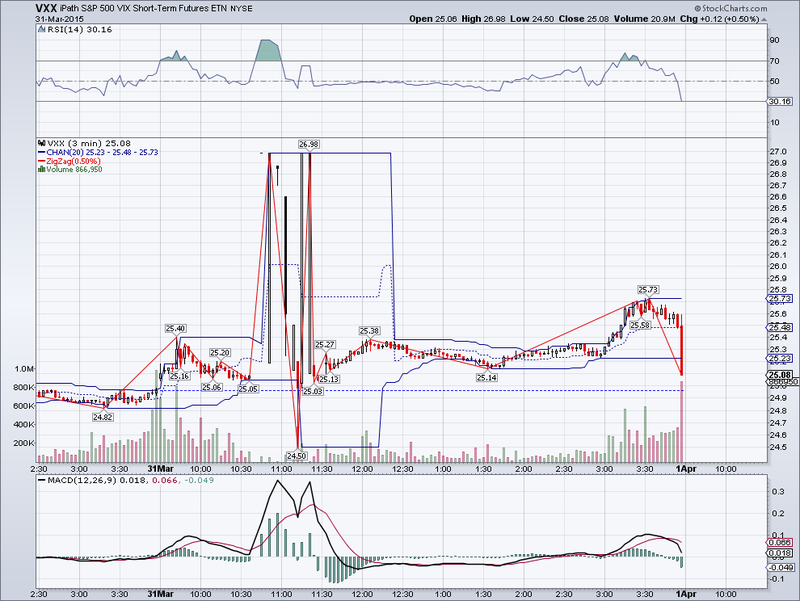 If I am wrong on the pullback, I'll switch them for VXX which is at an all time low. The market went into a correction expected and we could see a triangle form or a zig zag before going to an all time high challenge. 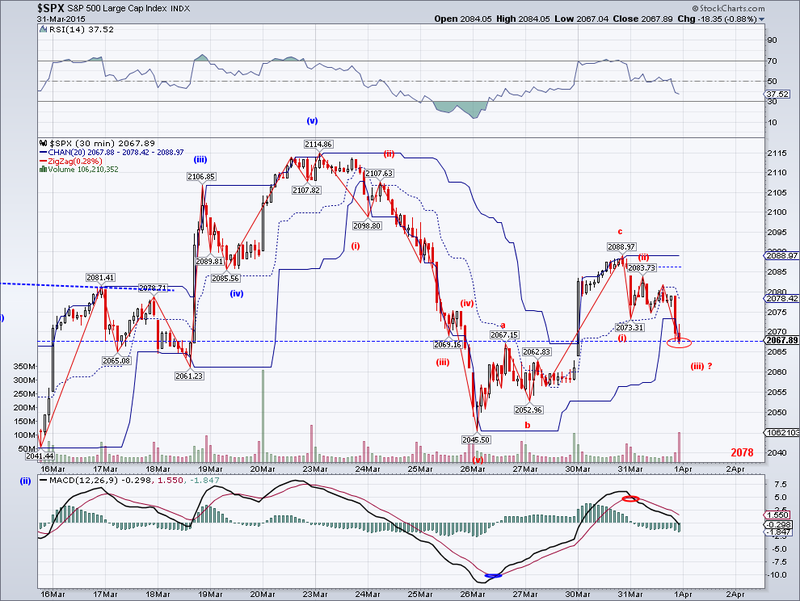 Trade under 2081.41 would eliminate the bullish 5 wave count, so all is clear as long as support doesn't get breached. Also, it's worth noting the RUT already made substantial new all time highs yesterday and a little help from oil and the dollar could easily lift the broader market to new highs next week. I ended up buying some oil today given it's lower risk/reward set up for another tradeable bounce to its 50 DMA. 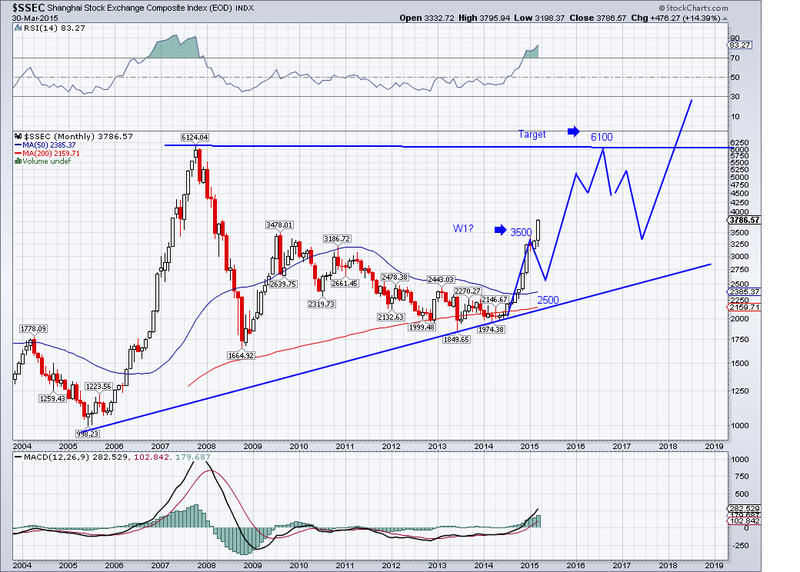 Gold and Silver look promising as well, but I rather wait and buy on a pullback. "given the bullish pattern in place, it is likely the trend will go bullish as soon as tomorrow and see the all time high challenged in the next week or two"
As expected, the market rallied today after the Fed announcement and the Trend Average has turned bullish. It's hard to say if the all time highs will be challenged this week since we might see the market go into a W4 correction but higher highs are very likely, unless there's some bearish miracle. An ongoing rally in the US would be in synch with all the major markets around the world, which in a way would feed on itself given worldwide enthusiasm for stocks. But as usual, there will be another bearish excuse for yet another round of selling once enthusiasm dissipates, it happens like clockwork. I ended up selling half of my Russian stocks to position trade and raised my stops to break even on the rest and I am leaving my Chinese stocks intact as they're going way up. Hopefully, I will buy some VXX when this rally ends later this month or April. The market found support at the 2065 level and it has a good chance of breaking the 2081-83 resistance tomorrow. 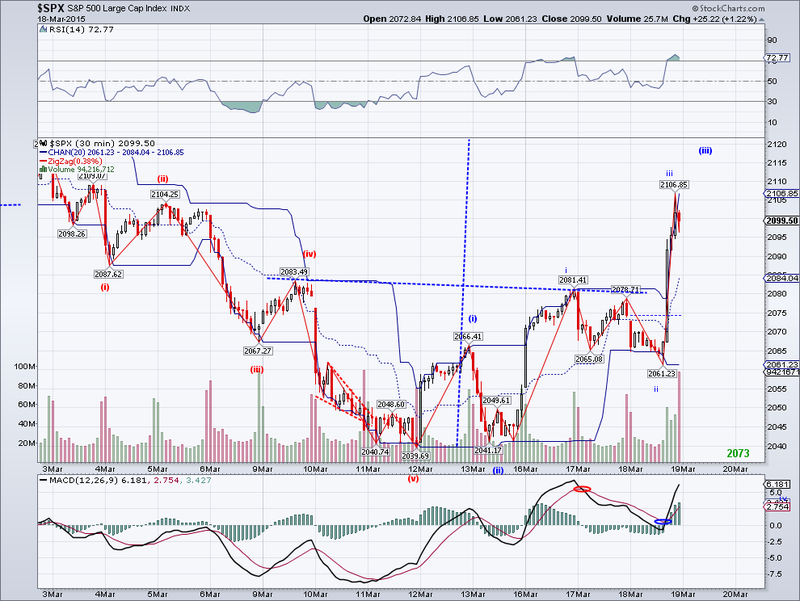 Today's close was again above the Trend Average but it wasn't strong enough to turn the the TA bullish. However, given the bullish pattern in place, it is likely the trend will go bullish as soon as tomorrow and see the all time high challenged in the next week or two unless there's some sort of unexpected bad news. Focus has now turned to the Feds on rates and this might just provide fuel to yet another rally. But stock market aside, the fact rates are going to increase shows how long the country has come in its economic recovery. I remember in the darkest days of the financial crisis, people were preparing for the Great Depression but thanks to Feds, the worst never materialized. I don't think most people fully appreciate (or understand) how bad things could have turned out. And yes, I know some people are convinced we are headed towards economic disaster very soon, but imo rising rates means we're officially all clear. If anything, we might be in the middle of one of the longest expansions in economic history when looking at the world as a whole. "However, given the low for today was again the 2041 support level, there's a good chance there will be another attempt to test the TA early next week." That higher low on Friday turned out to be a clue of what came today. The Trend Average was not only tested, but re-captured. While it's still too early to give the bulls the all clear, that 2041 level holding gives a bullish bias to the market. If we are going to see a deeper correction, support must break in the next few days or else the market will be making all time highs again. Markets around the world from China to Germany are hitting all time or multi-year highs, so it makes more sense the US joins the party during this period. Some people might worry about oil and dollar strength, but as I've been saying for months, they are just excuses (oil hit a multi-year low today at $42 and the dollar hit a multi-year high) as proven today. I am holding to my Russian and Chinese stocks short term trades and added more China to my long term portfolio. Maybe I'll get a chance to short this time if the market goes for the ATH. The market headed down as expected but it fell short of testing its Trend Average. However, given the low for today was again the 2041 support level, there's a good chance there will be another attempt to test the TA early next week. 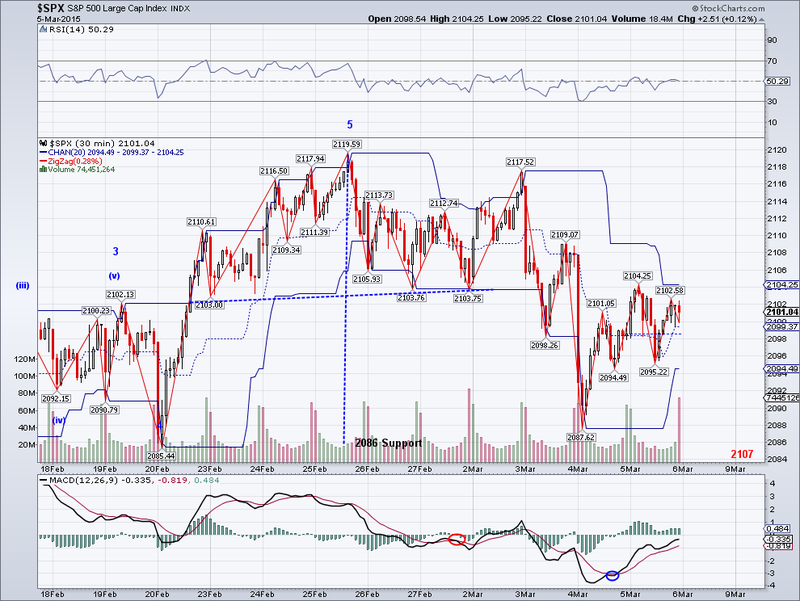 What will happen then will probably dictate market direction for the rest of the month. Failure to turn the trend bullish will most likely result in lower lows, but a re-capture of the TA opens the chance for new all time highs as the market has corrected enough to build another base for another multi-week rally. Oil is testing its lows and might end up making lower lows, which will create new opportunities for a counter rally trade in oil related stocks. "The next support level is at 2041 and it looks like the bottom could be in today or tomorrow at the test of this level." The market bounced as I had been expecting towards the 50 DMA and now there's a good chance the Trend Average will be tested as well. 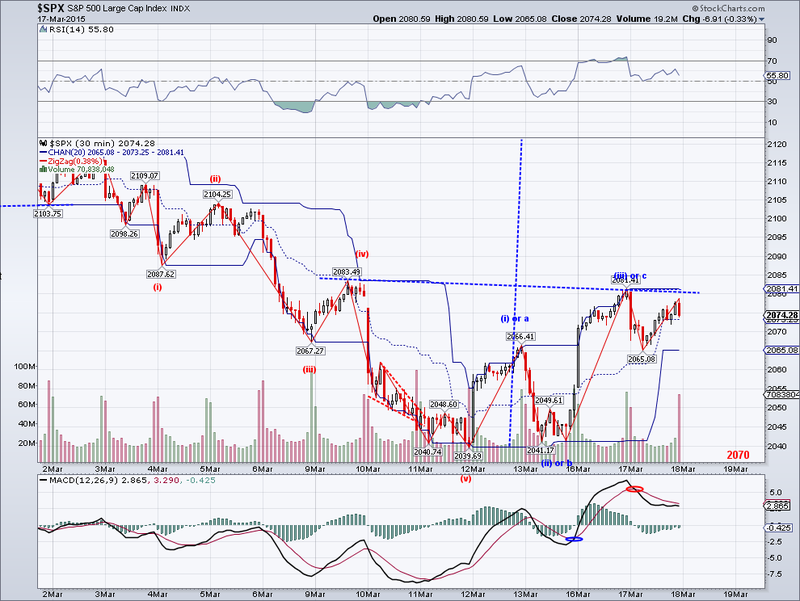 Assuming this is a counter-rally, we should see the market head down again once it hits resistance. But given the fact the reason for selling has been rather weak, we could see follow through buying and a trend change if the TA gets convincingly re-captured. I sold some of my China ETF that I had been holding since last year and replaced them with Russia. While Russia is probably nowhere near out of its economic crisis, stocks there are ridiculously cheap. 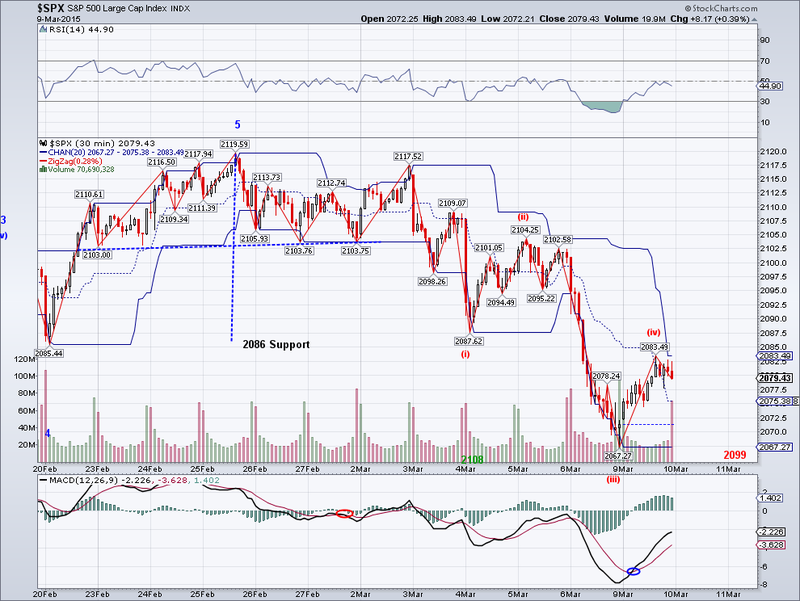 The sell off continued today and tested the 2041 level I was expecting. Ideally, the bottom will be at this support level for wave proportionality purposes, but if this level breaks then we're looking at 2021 as the next stop. The ongoing bearish theme continues to be the strong dollar, which is getting closer to parity with the Euro and causing a sell off in gold and silver as well. 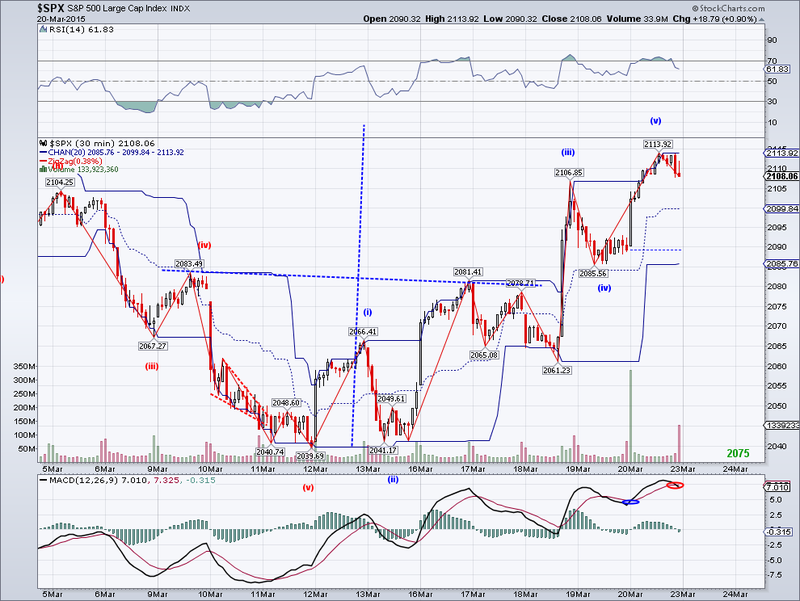 But let's not forget this entire move was expected, so technically speaking there is nothing out of the ordinary. The downtrend has continued as expected and we should see 1186 tested fairly soon given the current trend. What will be interesting is whether gold will be aiming for the 1130 low from last year. 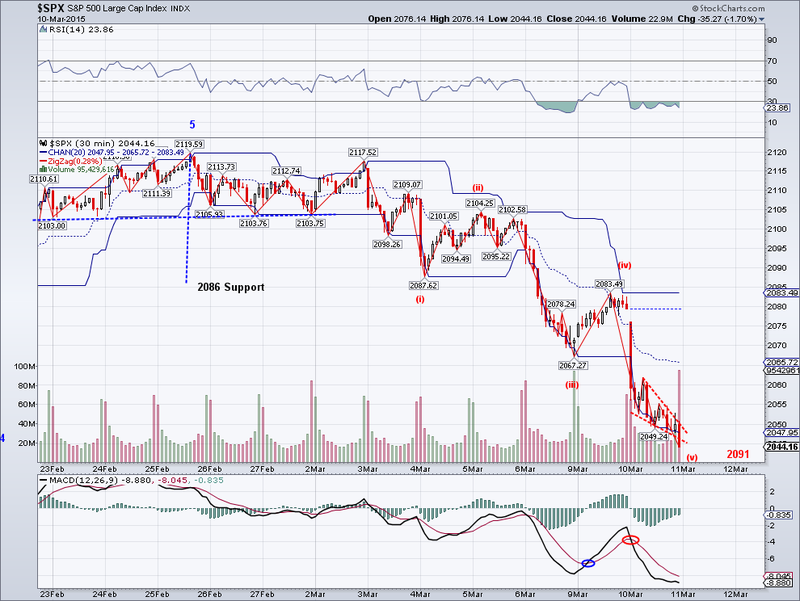 The market put in another bearish wave as expected and it broke through the 2056-62 support easily. The next support level is at 2041 and it looks like the bottom could be in today or tomorrow at the test of this level. 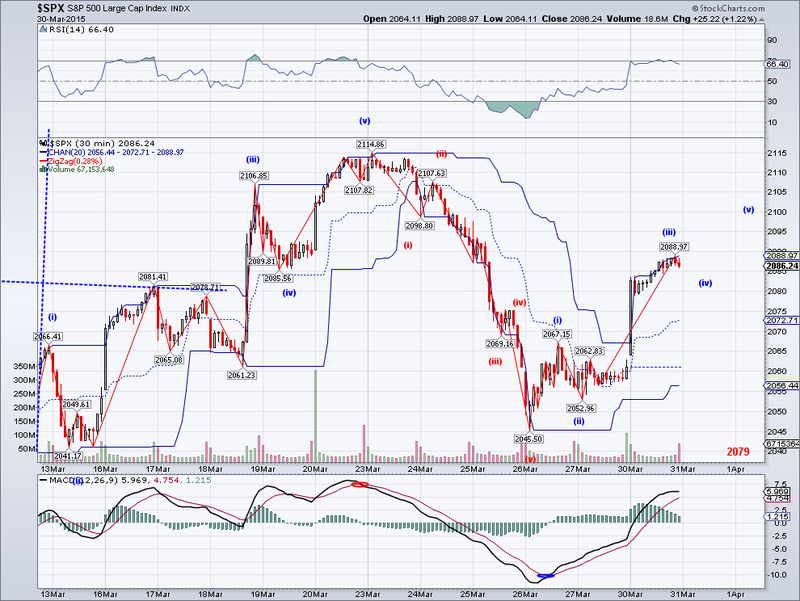 Now, the counter rally should be interesting as this wave could turn out to be part of a zig zag. I expect the 50 DMA to be naturally challenged but 2072 and the top itself at 2120 could be targets. The Trend Average is now at 2091 and falling and most likely will be tested as well on the coming bounce, whether the TA can change to the bullish side it's another question. The theme of the moment is now dollar strength, but will that be enough to cause a panic sell off? I doubt it will but we'll see. I bought back the Russian ETF for the bounce. The market bounced today in what seems like a consolidating 4th wave and we should see the 50 DMA at 2062 tested if 2087 doesn't get breached. Once a lower low is made, we should see another counter rally that should give us an idea if this is part of a zig zag (bullish) or the beginning of a stronger correction that will be challenging the 200 DMA currently at the 2000 level. I guess it will depend on how the market decides to price the interest rake hike coming in the summer. 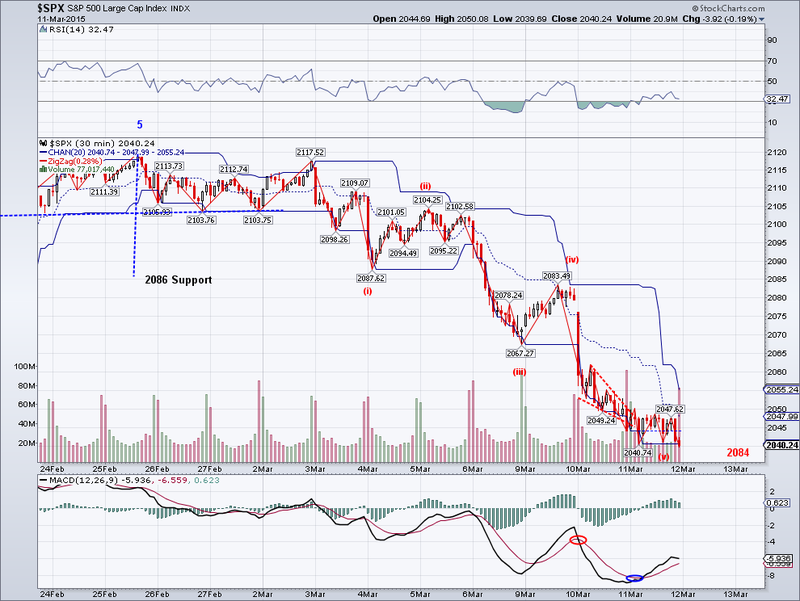 The market broke 2085 support decisively, solidifying the bearish trend change. The next obvious target is the 50 DMA at 2062, which sits right on the next level of support at 2056-2062. So we'll see how this level holds early next week. 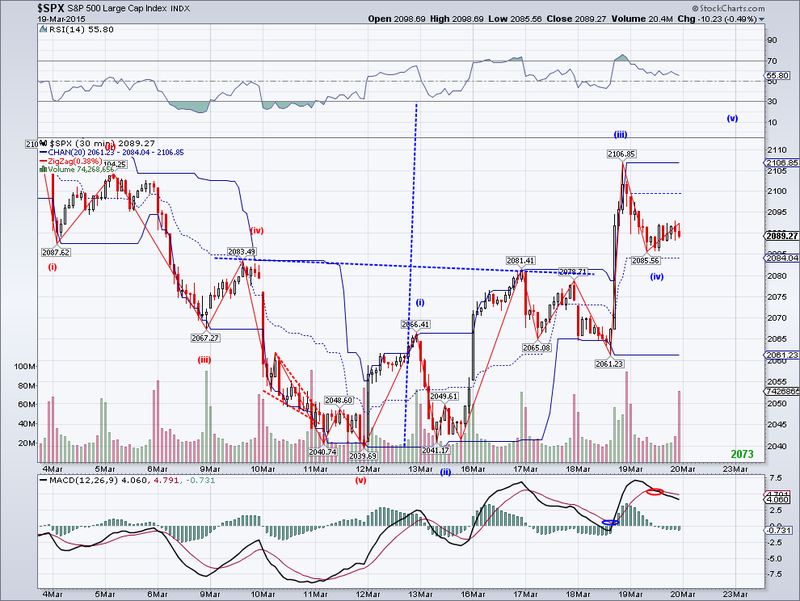 Additionally, we have a rollover on the daily MACD which points to a bigger correction. Whether this pullback will be a sideways move like the last correction or one that goes for a 5-10% retracement will depend on how the market reacts at the 50 DMA and the 200 DMA levels. I stopped out of my new Russian position when support was breached but looking to buy again at the next support level. Just too bad we didn't get an euphoric high to short and take advantage of this expected correction, maybe next time. 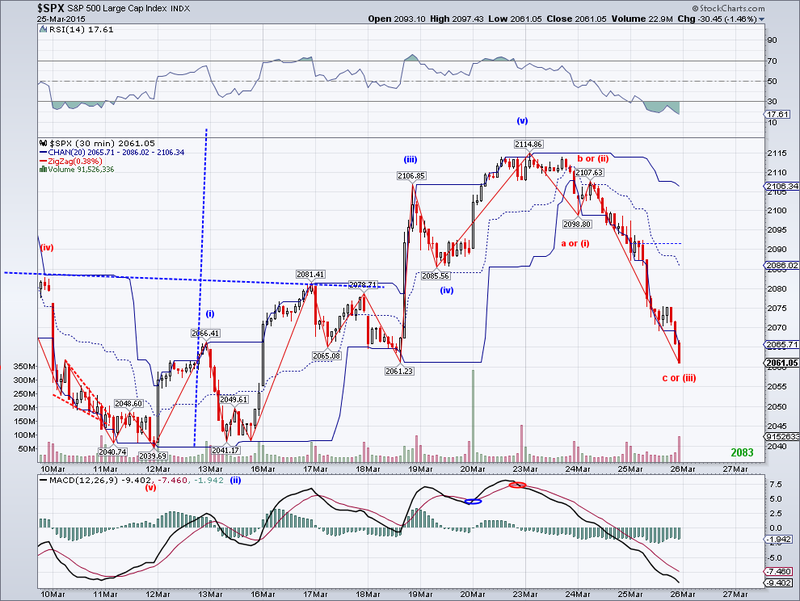 The market did not sell off to verify the bearish count but it wasn't able to re-capture its Trend Average either. So the market is technically stuck between the 2085 support and 2103 resistance, and my guess whichever breaks first will likely point to where the trend is going in the next few days. The TA has now officially turn bearish since the number has started to drop, so I guess it will come down to the jobs report for a good excuse to move the market. I started long positions in Russia using 2085 as a level to monitor or stop out. I figure if oil continues to stabilize and Putin doesn't go too crazy, RSX will be tested its 200 DMA at around $20. 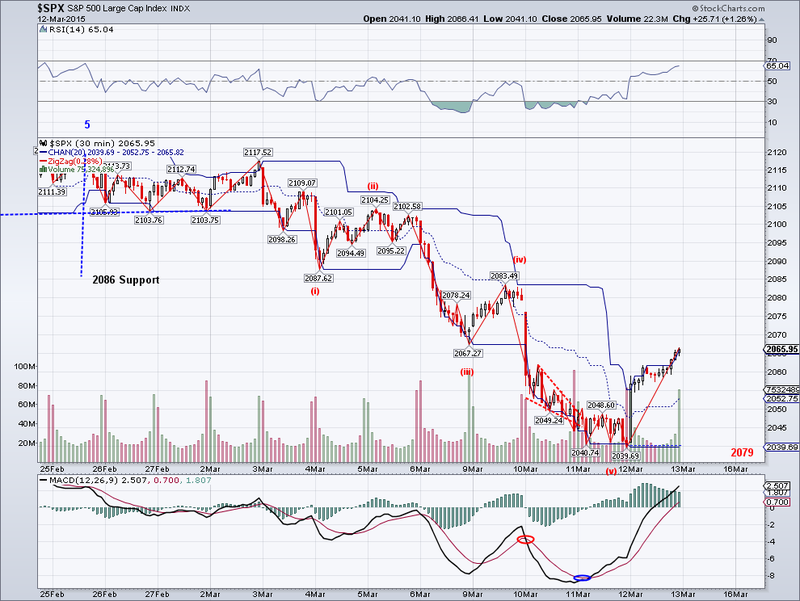 The bearish pattern on the chart reached its target today by testing the 2085 support level. Also, the Trend Average is being challenged with today's close and unless we see a rally tomorrow that re-captures 2108 convincingly, we should see lower lows. 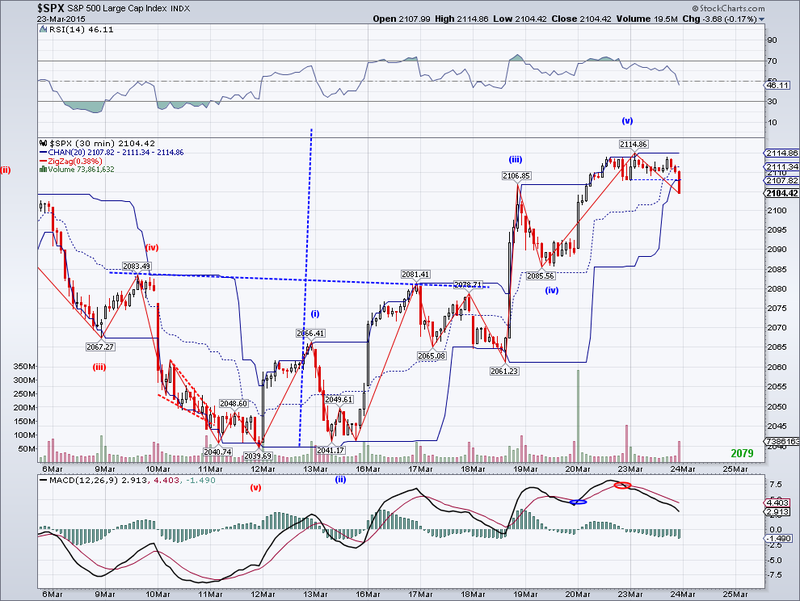 With that said, the waves in the last few days look very corrective as they overlap each other. So the only bearish option for all these waves to make sense is a sell off tomorrow on a W3, anything short of that will likely point to these last 5 days as a correction and a new rally to new highs. If we see a sell off, I will use the opportunity to buy more longs for my long term portfolio (maybe add some Russian positions?). But if we get that new high, I will short to hedge as I've been planning for the past few weeks. The market did not follow through on yesterday's rally and surprisingly a new all time high on the SP500 was not reached. Still, not all hope is lost since these waves from the 2019 high look corrective and possibly is setting up the market for a stronger rally than the ones we've seen recently. The key support level to watch for is now 2085 and obviously the Trend Average at 2108, which the market must recapture in order to maintain a bullish bias. The market did not follow through on its bearish pattern and instead managed to get very close to its all time high. But since the the DJIA, RUT and the NASDAQ closed at significant highs, it's very likely the SP500 will make another ATH soon. Whether or not it will get 2,150 will depend on a micro-W3 materializing in the next couple of sessions. A breach of 2,103.75 would eliminate the bullish bias. Maybe I'll get to short to hedge after all when bears throw in the towel.